This week’s topic is ‘Top Ten Favorite Movies or TV Shows’. I have decided to narrow down the TV series element of the prompt to anime. 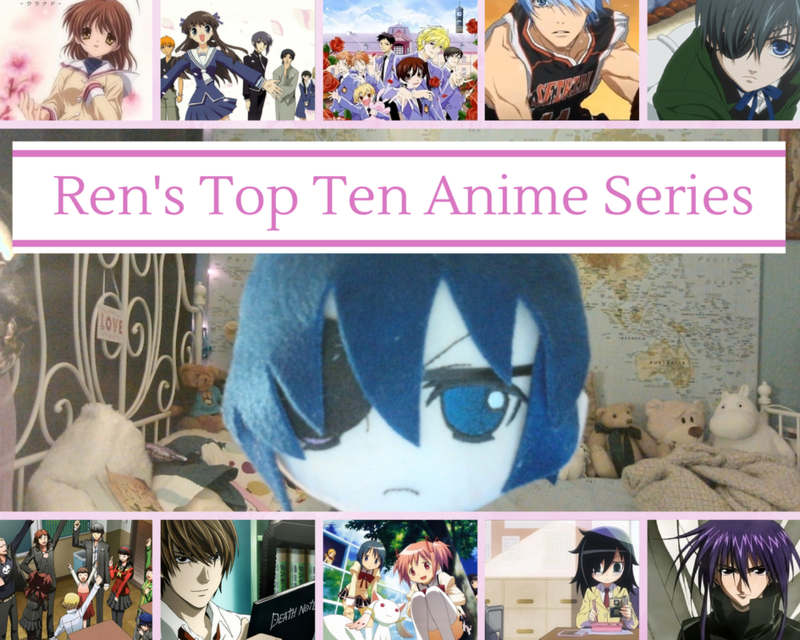 So today I’m sharing my personal top ten favourite anime shows. I cried the first time I watched Clannad. It was too much for me, in a good way. The Clannad anime is based on the visual novel of the same name. It follows Tomoya, a troublesome student, and the relationships he develops with the people around him. There’s a strong emphasis on the relationships he forms with the girls as the original game had a strong romance element. It’s a sweet and touching story. In this series both tragedy and joy occur in a realistic and, simultaneously, fantastical world. I love revisiting this story, it’s definitely a favourite of mine. A young woman called Tohru is living in a tent in order to not inconvenience her extended family with her presence after her mother’s death. But she has set up camp on land owned by the Sohma family who have a dark secret. Tohru’s life soon becomes bound with that of the Sohma’s after she discovers the truth behind their curse. Sweet, funny, deceptively dark and quite touching, Fruits Basket was the second anime series I seriously invested in. The manga was a big part of my life for a while so I had to watch the anime. However, whilst I love this anime I would really love a Fruits Basket remake that covered the later manga volumes. A scholarship student stumbles into a music room only to find it occupied by the school’s resident Host Club. After breaking a VERY expensive vase Haruhi is forced to work at the Host Club until she can recuperate the debt. Much cross-dressing hilarity ensues. This series is my go-to anime if I need to be cheered up. I can’t watch an episode without wanting to laugh at some point. From the twins’ hi-jinks to Tamaki’s charm, I love the Host Club characters through and through. Kuroko was once a member of the Generation of Miracles, a well-renowned basketball team. But he was the invisible man. 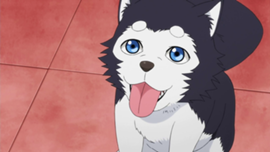 Now he attends Seirin High and wants to put his shadow skills to good use again by joining their basketball team. How will he fare against his previous team mates? Can his new team understand and use his unique set of skills? Can Kuroko develop his basketball techniques further? All these questions and more are explored in this anime series. I don’t usually watch sports anime shows but I seriously enjoy this one. The matches were really cool to watch and Kuroko is AWESOME. I love Kuroko’s work ethic and how he wants to be the shadow that makes the light on the team shine brighter. I also love Tetsuya #2. Who wouldn’t?? Who could not love a show about a boy out for revenge with the help of his demonic butler? I love the concept, the characters and the Victorian setting. I re-watch this series frequently. Heck, I’ve even written Black Butler fan fiction. I’m really looking forward to watching the new Black Butler anime series, Book of Circus. Any one who knows me well knows that I am obsessed with Persona 4 so it goes without saying that I enjoy the anime. The Death Note can be used to kill people by simply writing down their name. Light Yagami, an exceptionally intelligent student, stumbles upon the Death Note and becomes twistedly consumed by the power it gives him. This is a show with a great soundtrack, a thrilling story line and complex characters. Gotta love it. Two girls are offered a contract by a mysterious creature: they can have their deepest wish granted in exchange for magical powers that must be used to fight witches. This show is very clever in terms of what it does with the Magical Girl genre. I love this anime. The plot is deliciously twisted and goes in unexpectedly dark directions. The art is beautiful. If you haven’t watched this series already I heartily recommend it. Ah, Tomoko. The epitome of awkwardness. She’s a shy girl who wants to be popular but her biggest enemy in her quest is often herself. She makes me cringe and squirm at times but the trials she goes through as a socially awkward teenage girl in high school is tortuously empathisable. I always want to look away but I CAN’T. Daisuke has inherited the ability to transform into Phantom Thief Dark. The transformation process is closely tied with his romantic urges which makes being around the Harada twins at school quite a challenge. By day Daisuke must try to be a normal teenager and by night he must become Dark and steal priceless pieces of art. You know when I said Fruits Basket was the second anime series I seriously invested time into? Well, D.N. Angel was the first. I’m not saying it’s necessarily a masterpiece but it was my introduction to the world of anime so it will always have a place in my heart *sniffle*. Feel free to recommend anime shows to me in the comments.